Havasu Realtor Charitable Assistance Foundation has been arranging an event in the opening day to entertain the guest easily. On 25th February, 2017 you may able to join others in the Springberg McAndrew Park which can be found from the Querio Drive corner and McCulloch Boulevard. Popularity of this event has been increasing. Therefore, you may miss certainly a lot of things by not joining the even if you are staying close to Lake Havasu. To pep up the audience from the first time they set foot in the park, a music anthem called “A Day at the Park” has been created. Chili Cookoff can be seen too. For the adults, a Salsa contest has been arranged. Therefore, romantic ambience can be guaranteed through the Havasu Realtor Olympics. In addition to adults, lots of activities have been arranged for the kids also. They can easily take part in the bounce house and face painting. Other events such as 50/50 ticket sales in addition to Bloody Mary have been arranged also. Beer and hot dogs are served at free of cost. However, donation is always welcome from the audience. 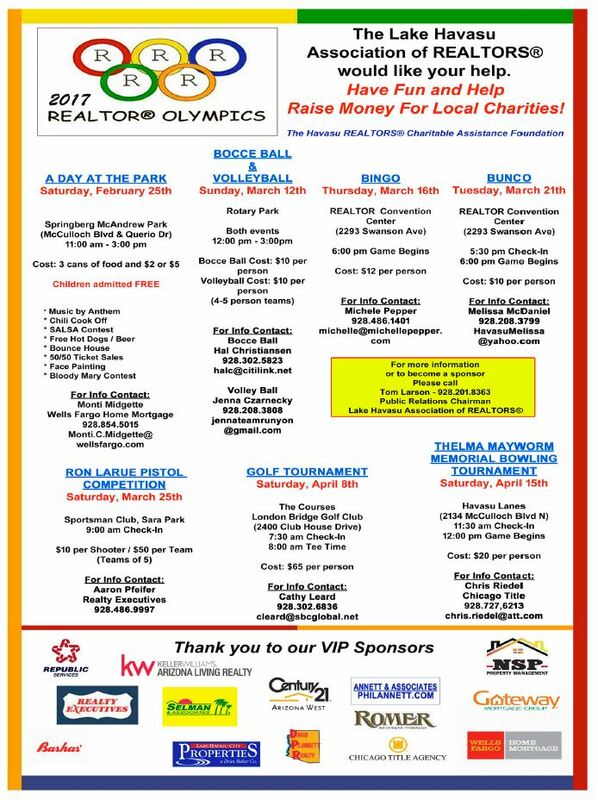 If you have decide to visit the Havasu Realtor Olympics in Lake Havasu then you must show up on the day by 11 am. For the event, you may have to pay $2 along bring 3 cans of food. However, you may be allowed to enter the event at the price of $5 also. Entry fees are taken from adult only. There is no need to pay anything for the kids. One of the main purposes of the event is to collect as much charity as possible for the locals. From 25th February, the event may open for the audience. However, there have been several programs on the month of March and April also. It is possible to observe an exciting Bocce Ball and Volleyball Matches on 12th March. The event is organized on Sunday. Therefore, everyone can take part in this competition. On the field, an exciting day can be spent with friends and family. Rotary Park has been chosen as the location of matches. Therefore, you must be visit the park to see your loved ones. Rush of adrenaline may reach at the climax point during the match. Sporting spirit can be showcased at the time. The game may go on from 12pm to 3pm. Teams with 4-5 people can be noticed at the time who can participate in the match by paying $10. The fee has been decided for each person. For Bingo lovers, there is an opportunity too. On 16th March, they can take part in the game that starts from 6 pm at the Realtor Convention Center. Fees are on little bit higher range with $12 for every person. At the same location, Bunco will be organized on 12th March. Checking time for the event has been 5:30. However, the game may start from 6pm. In addition to above events, there are certain programs on 25th March, 8th April and 15th April respectively with the games like pistol shooting, golf and bowling. Due to ranges of games, it can be called truly an Olympic. What do you think?